Today is bake day, the day I spend with my Mom, my sister and all our kids and we make goodies. Goodies to give, goodies to have for our Christmas dinners, and goodies to eat while we work. While we work, we listen to Christmas music, we talk, we sometimes play cards if we have a lull, and we laugh a lot. This year with how Christmas falls on Sunday, and how my nephews school schedule was laid out, we are a little later than normal for our special day, it would seem... but nonetheless, I am excited to be some of my favorite people in the whole world. Each of us pick several treats to make, we then make at least three batches of each to share. 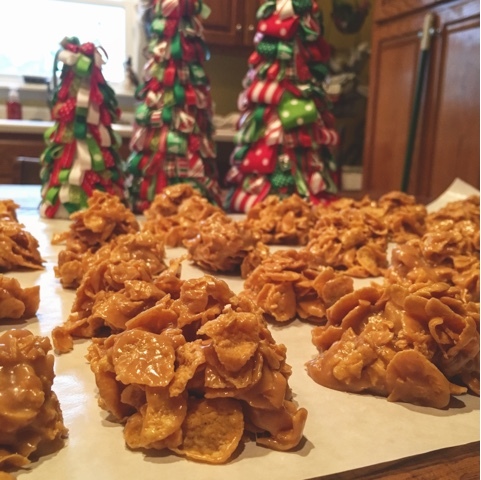 This year, my three treats are peanut butter fudge, oreo balls, and cornflake candy. Lay out some wax paper to drop your candies on after you mix everything. Combine sugar and corn syrup in a medium saucepan and cook til boiling, stirring often. Once your mixture is boiling, remove from heat, stir in your peanut butter and your vanilla. Once smooth add your cornflakes. Mix to combine. Drop rounded spoonfuls onto wax paper and let cool. Depending on how large your candies are will depend on how many you end up with. I got about 18-24 good size candies. Combine sugar and milk and bring to boil, stirring constantly. Boil hard for three minutes. Remove from heat and stir in peanut butter and then marshmallow cream. Dip in white chocolate, milk chocolate, dark chocolate or whatever you choose. Sprinkle with colored sugars, etc for a more festive look. I hope you have a wonderful day!!! Happy Christmassing to you all!